LingvoSoft Talking Dictionary English <-> German for Windows is part of LingvoSoft Suite - the complete language solution available only from LingvoSoft. 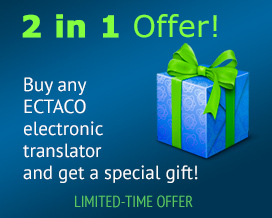 First choice at home, at school or at work, LingvoSoft Dictionary provides instant bilingual translations that can be voiced aloud using the latest TTS (text-to-speech) functionality, delivering accuracy you can depend on time and again. LingvoSoft Talking Dictionary English <-> French for Windows is part of LingvoSoft Suite - the complete language solution available only from LingvoSoft. First choice at home, at school or at work, LingvoSoft Dictionary provides instant bilingual translations that can be voiced aloud using the latest TTS (text-to-speech) functionality, delivering accuracy you can depend on time and again. LingvoSoft Talking Dictionary English <-> Portuguese for Windows is part of LingvoSoft Suite - the complete language solution available only from LingvoSoft. First choice at home, at school or at work, LingvoSoft Dictionary provides instant bilingual translations that can be voiced aloud using the latest TTS (text-to-speech) functionality, delivering accuracy you can depend on time and again. LingvoSoft Talking Dictionary English <-> Italian for Windows is part of LingvoSoft Suite - the complete language solution available only from LingvoSoft. First choice at home, at school or at work, LingvoSoft Dictionary provides instant bilingual translations that can be voiced aloud using the latest TTS (text-to-speech) functionality, delivering accuracy you can depend on time and again. 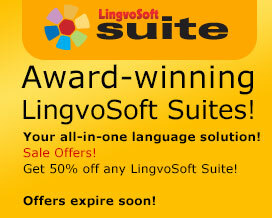 LingvoSoft Talking Dictionary English <-> Russian for Windows is part of LingvoSoft Suite - the complete language solution available only from LingvoSoft. First choice at home, at school or at work, LingvoSoft Dictionary provides instant bilingual translations that can be voiced aloud using the latest TTS (text-to-speech) functionality, delivering accuracy you can depend on time and again. LingvoSoft Talking Dictionary English <-> Polish for Windows is part of LingvoSoft Suite - the complete language solution available only from LingvoSoft. First choice at home, at school or at work, LingvoSoft Dictionary provides instant bilingual translations that can be voiced aloud using the latest TTS (text-to-speech) functionality, delivering accuracy you can depend on time and again. LingvoSoft Talking Dictionary English <-> Arabic for Windows is part of LingvoSoft Suite - the complete language solution available only from LingvoSoft. First choice at home, at school or at work, LingvoSoft Dictionary provides instant bilingual translations that can be voiced aloud using the latest TTS (text-to-speech) functionality, delivering accuracy you can depend on time and again.